A team of cardiovascular surgeons at Allegheny Health Network's Allegheny General Hospital has become the first in the Pittsburgh region to use a groundbreaking new technology to provide relief for people suffering from peripheral artery disease (PAD). Highmark Health’s VITAL Innovation Program partnered with AHN to introduce the technology to the Pittsburgh market. We now have the ability to clearly see our way through the artery. This means there is less risk of damaging the artery walls. A team of cardiovascular surgeons at Allegheny General Hospital (AGH), part of Allegheny Health Network (AHN), has become the first in the region to use a groundbreaking new technology to provide relief for people suffering from peripheral artery disease (PAD). Highmark Health’s VITAL Innovation Program partnered with AHN to introduce the technology to the Pittsburgh market. Affecting nearly 20 million adults annually in the U.S., PAD is caused by a build-up of plaque that blocks blood flow in the arteries of the legs or feet. Until recently, physicians treating PAD through interventional means relied on the use of X-ray and a touch-and-feel approach to guide their way through the arteries to the area of obstruction. Now, through an advanced imaging tool called optical coherence tomography (OCT), physicians are able to navigate through arteries more effectively and safely to remove blockages and achieve the best possible outcome for the patient. OCT is the hallmark of innovative catheter instruments developed by California-based Avinger – called the Ocelot™ lumivascular and Pantheris™ atherectomy systems – that are being used by the AGH team. “Previously, the way we treated PAD with catheters was a bit like driving down your street in the dark,” said Satish C. Muluk, MD, Director of the Division of Vascular Surgery and Vice Chair of the Department of Thoracic and Cardiovascular Surgery at AHN. “You might know where you’re going, but you can’t see everything along the way. Using Ocelot and Pantheris, however, is like turning on the headlights. Using Pantheris, which the U.S. Food and Drug Administration (FDA) approved in March, physicians can see and remove plaque simultaneously during an atherectomy, a minimally invasive procedure that involves cutting plaque away from the artery and clearing it to restore blood flow. For a complete blockage of the artery, known as a chronic total occlusion (CTO) and something that is more common in older patients, AGH vascular surgeons are also now able to use the Ocelot catheter. Results from a 130-patient clinical trial of the Pantheris device demonstrated a vessel restenosis rate of just 8% and no vessel perforation, clinically significant dissection or late aneurysm. Often misinterpreted as the normal signs of aging, symptoms of PAD include painful cramping, numbness or discoloration in the legs or feet. PAD can become so severe and difficult to address with traditional treatments that patients and physicians often resort to undergoing invasive bypass surgeries, which can result in additional health risks and lengthy, painful recoveries. In severe cases, patients often face limb amputation. Hospitalization costs for PAD exceed $20 billion per year, largely because the disease is often diagnosed late. This high cost is one of the reasons Highmark Health, the parent company of AHN, chose to use its VITAL program to explore ways of improving patient outcomes from the disease in the most cost-effective and efficient manner. Launched in 2015, the VITAL program is designed to provide the missing link between FDA approval of an innovative technology and its full reimbursement by commercial insurers. VITAL is currently supporting the study of several additional leading-edge medical breakthroughs at AHN hospitals, including the LINX® Reflux Management System for treating patients with gastro-esophageal reflux disease (GERD); the HeartFlow non-invasive diagnostic technology that offers physicians insight into both the extent of a patient’s coronary arterial blockage and the impact the blockage has on blood flow; and the Freespira Breathing System for patients who suffer from panic disorders and symptoms of panic. Highmark Health, a Pittsburgh, PA based enterprise that employs more than 35,000 people nationwide and serves 40 million Americans in all 50 states, is the third largest integrated health care delivery and financing network in the nation. Highmark Health is the parent company of Highmark Inc., Allegheny Health Network, and HM Health Solutions. Highmark Inc. and its subsidiaries and affiliates provide health insurance to 5.3 million members in Pennsylvania, West Virginia and Delaware as well as dental insurance, vision care and related health products through a national network of diversified businesses that include United Concordia Companies, HM Insurance Group, Davis Vision and Visionworks. Allegheny Health Network is the parent company of an integrated delivery network that includes eight hospitals, a community-based network of physician organizations, a group purchasing organization, ambulatory surgery centers, and health and wellness pavilions in western Pennsylvania. HM Health Solutions focuses on meeting the information technology platform and other business needs of the Highmark Health enterprise as well as unaffiliated health insurance plans by providing proven business processes, expert knowledge and integrated cloud-based platforms. To learn more, please visit http://www.highmarkhealth.org or http://www.vitalinnovationprogram.org or contact Highmark Health at 412-544-0968. Allegheny Health Network, part of Highmark Health, is an integrated healthcare delivery system serving the Western Pennsylvania region. 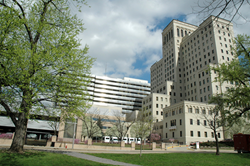 The Network is comprised of eight hospitals, including its flagship academic medical center Allegheny General Hospital, Allegheny Valley Hospital, Canonsburg Hospital, Forbes Hospital, Jefferson Hospital, Saint Vincent Hospital, Westfield Memorial Hospital and West Penn Hospital; a research institute; Health + Wellness Pavilions; an employed physician organization, home and community based health services and a group purchasing organization. The Network employs approximately 17,500 people and has more than 2,800 physicians on its medical staff. The Network also serves as a clinical campus for Drexel University College of Medicine, Temple University School of Medicine and the Lake Erie College of Osteopathic Medicine.